I received a request for Rihanna’s gold hoop earrings on Saturday Night Live. Rih wore custom lion head earrings designed for her by Dana Lorenz of Fenton/Fallon Jewelry. 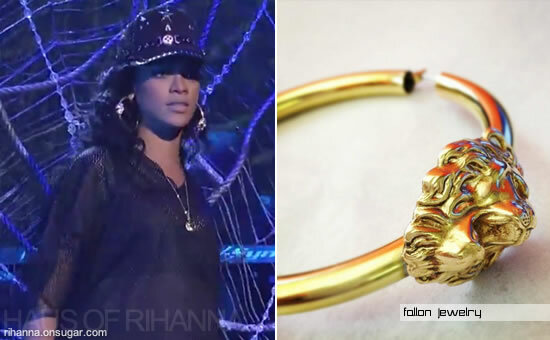 The Fallon Spring 2012 collection included several pieces that featured lions and although you can’t get your hands on Rihanna’s exact earrings you might find something else that you like in their online store.